In 2010, Gabrielle Markowitz set up a Facebook account in the name of her then-newborn daughter, Hallel. Called Hallel Mini Supermodel, the page is part of Markowitz’s goal to change the public perception of people with disabilities. And she has made some progress. Hallel has Down syndrome. 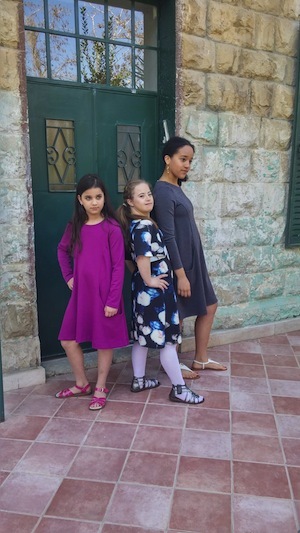 Set to start Grade 1 this September, she was chosen, along with several other Israeli children of varying abilities, to model the 2017 summer collection in Select Fashion and Totto bags’ Back to School ad campaign. The shoot was in collaboration with the Israeli organization Beyachad, which works to increase and strengthen society’s inclusion of people with disabilities. Beyachad was started by Channie Plotnick, a New Yorker who has been concerned with this issue since she was 9 years old. “I was living in New York,” said Plotnick, who now lives in Israel. “Not far from the home where I was growing up, there was a home for adults with disabilities. I was going to school every day and doing my thing. I’d pass by the home and I could see the people with disabilities through the windows. I could see them just sitting around and pretty much doing nothing – being locked in that home for many, many hours, just sitting around. “I saw this a couple times a day, every day. I felt that these people are jailed in this place. I figured, I have to figure out a way to get them out of this. One day, I asked my mom if I could invite them for Shabbat morning. My mom said to give them my phone number and see. So, one Friday, they actually called and said they wanted to come over for Shabbat morning. “I can remember myself sitting at home at the window and looking out that morning, and waiting anxiously for them to come. It was sort of a big group. I think there were eight adults with two staff accompanying them. Plotnick has high expectations of herself as well as of others. Where some see disability, she sees ability. As an adult, Plotnick made aliyah. She attended Tel Aviv University and earned a bachelor’s degree in psychology and a master’s in special education. From then on, it was no longer enough for Plotnick to be able to see ability in all people. It was now about figuring out how to care for these abilities and shape them toward everyday integration into society. So, in 2008, Plotnick started up Beyachad Foundation, to aid in the empowerment and inclusion of people with special needs. “When someone wants to be in a regular school, we help them with resources, information, advocacy and case management, connecting them to the right people, figuring out how to get them resources from different departments,” said Plotnick. The Knesset calls Plotnick when they are considering disability inclusion-related laws. According to Plotnick, the welfare system disperses benefits according to labels – it puts people into a box labeled “Down syndrome” or “autism.” These labels carry with them a set of expectations, and the people become the label. Beyachad does not want to compete with, or put out of business, special ed schools or workshops. Its aim is to offer more options. “It’s a lot easier for us, as society, to adapt to the needs of the less-abled than it is for the less-abled to adapt to our society,” said Plotnick. “As such, we have a duty to adapt to their needs. “I’ll give you an example. If today we go out onto the street and all of the signs are in Braille, you and I would be the ones who are disabled, as we won’t be able to read them. Society has the ability to change people into disabled – and society has the ability to create people who are more able. Change will come slowly, but Beyachad has the motto ‘If it is to be, it’s up to me,’ and they work to provide the support individuals need to make accessibility possible. For more information or to lend support, visit beyachad.org.il.